The sooner you clean a dermaroller after rolling the better. To remove dried blood, first soak the dermaroller overnight in warm water with dishwashing detergent and rinse it with warm tap water tap in the morning. Let us know whether this worked. Using (bio) ethanol to disinfect the roller is OK. Blood contains hemoglobin, a red-colored molecule containing a lot of iron. It is conceivable that the hemoglobin has stained the needles, since the steel of the needles may constitute an ideal substrate for the hemoglobin to attach itself to on the molecular level. If you still see tainted needles after an overnight soak in soapy water and a vigorous rinse, you can assume that the discoloration you see is just a hemoglobin layer of a few molecules thick and does not pose any hygienic risk. You have a very smooth, nice complexion, I think it doesn’t need any improvement. There are no serious scars on your face, just a couple of enlarged pores. It is visible on the enlarged photo but in real life it will be much less noticeable. Many of our customers improved their scars by dermarolling or needling but very few of our customers managed to improve enlarged pores. I think you do not need any treatment. You can try a dermastamp (single needling is not necessary) but at the beginning, stamp just a very small area to see how it heals. Is the scar indented? It would be much better to use the single needle in your case. Needle it once in 3-4 weeks. The area above the lip is very sensitive and it is painful to needle there but to needle just a small scar should be bearable. Do not apply the A-Ret immediately after needling. I recommend applying the A-Ret immediately after needling or rolling in case of scars with hardened collagen which is not your case. Do not needle the whole scar during your first needling session. Do just a small part of the scar to see how it will heal. Dermarolling / Microneedling / OK to use Infadolan over Retin-A? You can use Tretinoin (it contains vit. A) and Infadolan (it contains vit. A and D) at the same time. No need to wait. First apply Tretinoin and then Infadolan. Fat-soluble vitamins, (D, E, K and A) can be mixed with creams or oils. No need to wait. Water-soluble vitamins, (C and B) can't easily penetrate oily surfaces. That is why you should apply vit. C on clean, ointment/cream-free skin, let the skin absorb it and only then apply a cream. Dermarolling / Microneedling / How do I singleneedle? Apply Infadolan after the rolling. Dermarolling / Microneedling / Suggestions for burn scar on forehead? You are lucky because your red stain is not a scar. It is just hyperpigmentation. It will disappear by itself but it can take a long time. Wait a month or two and if it is not improving, needle it (just shallow needling, no need to needle deep in this case) with the single needle. Needling will make it temporarily more red (for a day or so) but it will speed up the diminishing of the redness. Bimatoprost will likely be more successful in re-pigmenting vitiligo or hypopigmentation from cosmetic treatments than re-pigmenting stretch marks because stretch marks are really deep scars. We have many customers who achieved complete and permanent re-pigmentation of their hypopigmentation by single needling or dermarolling (without applying bimatoprost or anything else). Needling or dermarolling triggers or “wakes up” melanocytes (pigment producing cells). The A-Ret is certainly worth trying even with white stretch marks. Needle or dermaroll (with a one-liner dermaroller) the stretch mark and apply the A-Ret immediately afterwards. Dermarolling / Microneedling / Suggestions for chin scars? Yes I think you should stamp one scar and perform some kind of suction. Repeat the stamping and suction method every three weeks. Skip the A-Ret that night. The A-Ret is useful for scars with hardened collagen but you do not seem to have these. The scars on the chin are quite difficult to improve and you have to be patient and try various approaches. Check our forum posting called "Saline injections for acne scars". It also explains how to use the one-liner dermaroller. Our single needles are 2 mm long but if you want shorter, leave a note in the ordering form. Not in the PayPal comments but in the web store comments. You do not have to insert the single needle fully in but needle the stretch marks densely. 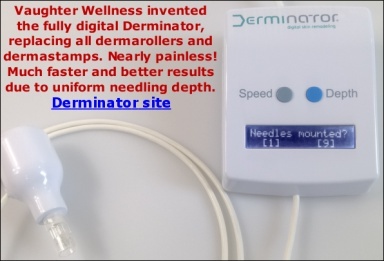 Dermarolling / Microneedling / dermaroller for stretch marks?! It's a liquid like water. You can use a cotton pad or use your fingers. You can wash it off in the morning. The alcohol is OK - please refer to the instructions. The roller comes in a plastic holder, inside a plastic wrapper, and the needles are sometimes protected with a plastic protection sheet as well. You are free to experiment with the Infadolan. First do a test patch on one scar. You do not have to do subcision. Stamp the scar with the dermastamp and perform some kind of suction method. Dermarolling / Microneedling / Stretch Marks Repigmentation - A new possibility? It sounds promising, nevertheless it is much easier to use it on vitiligo than on stretch marks. Vitiligo has no scar tissue. Vitiligo is normal skin that just lacks pigment producing cells – melanocytes. Bimatorprost may not work at all on scar tissue or the re-pigmentation will be uneven. Before you try Bimatoprost, you should smoothe out the texture of stretch marks as much as you can by repeated dermarolling or needling. Crush the hardened collagen bundles of stretch marks. This will greatly improve its texture. Needling or dermarolling also triggers new blood vessels (stretch marks have no or almost no blood vessels) which is very important for normal skin appearance and functioning. You can enhance Bimatoprost absorption by applying it right after very shallow needling. Do not needle deeply. Melanocytes are at the bottom of the epidermis, which is very shallow (about 0-2- 0.3 mm in the skin). What will be really difficult is to apply the Bimatoprost precisely to the stretch mark and not around it.. If you do not manage, you will end up with darkening of the skin around the stretch marks which will make them more visible. Maybe you can use a toothpick for precise application. Vitiligo is usually a wide patch of de-pigmented skin so it is much easier to target it precisely. In the mentioned study, they applied bimatoprost 0.03% ophthalmic solution at a dose of 1 drop per 2 cm2 of affected skin twice daily for 4 months. It did not say whether the re-pigmentation was permanent or they had to keep applying Bimatoprost to maintain it.